In these dramatic and perilous times, United Nations Deputy Secretary-General Jan Eliasson urged the international community to reaffirm the power and potential of bringing about change through peaceful means, following in the footsteps of Mahatma Gandhi, who inspired today’s International Day of Non-Violence. “The response to violence is all too often more violence when, in fact, reconciliation and dialogue is needed,” Mr. Eliasson said in a special event for the occasion, held at UN Headquarters in New York. He called for embracing the fundamental values embodied by Mr. Gandhi: passion, compassion, and belief in the dignity and equal worth of all human beings. The International Day, marked annually on Mr. Gandhi’s birthday, celebrates his non-violent philosophy and tactics have been adopted by leaders around the world. It was established by the General Assembly as an occasion to “disseminate the message of non-violence, including through education and public awareness,” and has been observed annually since 2007. Mr. Gandhi’s historic “Salt March” against unfair colonial taxation, and his other non-violent resistance inspired change in countries from the Georgia to South Africa, Northern Ireland and the United States, Mr. Eliasson said. This year’s event is particularly relevant given the resurgence of exceptionalism and sectarianism in parts of the world, the senior UN official said. He added that many minorities find themselves under attack, and civilizations are being displaced as conflicts force them to flee. The UN is strengthening its efforts to bring non-violence to concrete action through preventive diplomacy and the recent “Human Rights up Front” initiative which highlights the need for early action, and the crucial role of responding early to human rights violations. 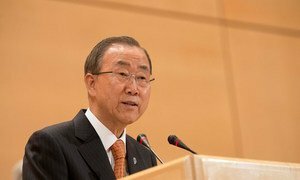 In his message Secretary-General Ban Ki-moon said principles enshrined in the Universal Declaration of Human Rights, adopted in 1948, the year of Gandhi’s death, owe much to Mr Ghandi’s beliefs. At this time of increased sectarian violence and the wanton destruction of cultural sites and heritage, “We have to foster a culture of peace, built on dialogue and understanding, for living together in harmony while respecting and celebrating humanity’s rich diversity,” the UN chief said.